Passed away peacefully with family by his side 2.4.2019 aged 70. 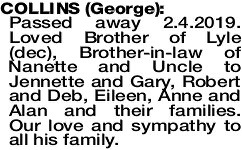 Much loved dad of Amanda, Fran, Eddie, Gemma and George and loved father- in-law of Geoff, Donna, Chris and Christine. Adored and loved Poppa to 18. Thank you for your love, support and guidance. We will miss your storytelling and your practical jokes, and will always have these special memories in our hearts. 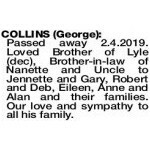 The Funeral Service to celebrate the life of Mr George Neish Collins of Mandurah formerly of Mollerin will take place in our Chapel 2 Leslie Street, Mandurah commencing at 10.00am WEDNESDAY (10.04.2019). No flowers by request donations in lieu to the Cancer Council. Passed away 2.4.2019. Loved Brother of Lyle (dec), Brother-in-law of Nanette and Uncle to Jennette and Gary, Robert and Deb, Eileen, Anne and Alan and their families. Our love and sympathy to all his family. 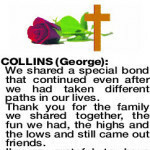 COLLINS GEORGE We shared a special bond that continued even after we had taken different paths in our lives. Thank you for the family we shared together, the fun we had, the highs and the lows and still came out friends. I'm so grateful to have shared your last weeks with you. The pain is now gone and you are safe with your mum, dad and brother. Brian and I will miss you so much. Brian has lost his farm buddy and things will be hard for a long time. 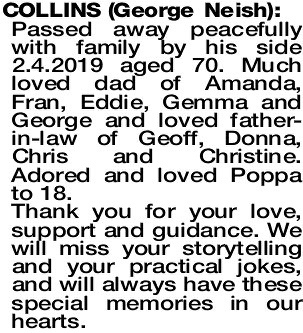 Special love to Amanda, Fran, Ed, Gemma, George and their families. We love you all so much and will always be here for you.